Brian Wilkerson was born in Lawrence Kansas and later moved to Twin Cities Minnesota. While in high school he wrote fanfiction about his favorite anime and while attending college he switched to original fiction. He majored in English Literature and History but ended up working for a bank. After hours he continues watching anime and writing original fiction. If you have ever played and enjoyed games like Final Fantasy, Baldur's Gate, Neverwinter Nights or any other role playing computer games (or even traditional pen and paper RPGs like I still remember them), then it is quite likely that A Mage's Power – Journey to Chaos Book 1 by Brian Wilkerson is a book you will like. Eric Watley, a rather ordinary, bullied, and often overlooked young man needs to finish a report for work but feels overwhelmed with it (and the rest of life) and calls out for help. Tasio, a so-called Trickster, is happy that he finally hears Eric's call for help and is even more delighted by the fact that Eric didn't specify what exactly he needs help for. With Tasio's help, Eric gets his report finished but is also transported into another world that is filled with magic and wonders. 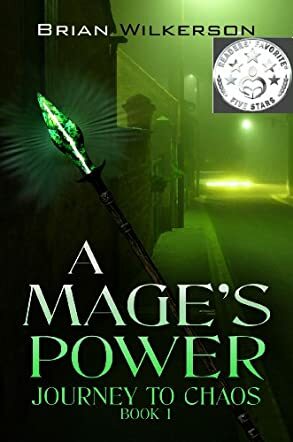 A world, in which he suddenly is a teenager again, has to go back to school, finally finds some (weird) friends and turns into a battle mage (who, of course, has to learn a lot about magic). And of course there's a princess to save –- but that leads to a lot of trouble! I enjoyed reading this book even though in some places it felt quite episodic, e.g. like something that could be turned into a season of longer TV series. Quite often (if you are a player), you will recognize where the author's ideas came from and at other times you feel like you would like to use your keyboard and mouse to move the character into a different direction. It certainly is a very entertaining story and the characters are really well done. There are witty dialogues and some unexpected turns –- I'd recommend the book to people who like light-hearted fantasy and don't mind odd situations.